An interview with John Foxx discussing the ideas and inspiration behind the From Trash album. A two-disc companion piece to From Trash, containing an album and interview CD. Sideways – originally released for Foxx’s 2006 tour – is made up of nine tracks that came out of the From Trash recording sessions, and includes extended versions of "Impossible" and "A Room As Big As A City". However the main album tracks, despite being from the same sessions, are all very different, and quite experimental, bearing a stronger resemblance to Foxx's earlier work. Foxx's love of old science-fiction b-movies is the main influence throughout the album with brain video implants, x-ray vision, ghosts, and car crashes making up some up some of the lyrical themes. This is also clearly reflected in the quirky album cover imagery. "In A Silent Way" and "X-Ray Vision" bear a strong similarity to something straight from Systems of Romance, giving a warm retrospective feel, with echoes of tracks such as "Slow Motion" and "I Can't Stay Long", which will undoubtedly please the more mature fan. Foxx's vocals bear a striking similarity to David Bowie on "Neuro Video", one of the album's more experimental pieces, which is followed by a Bowie/Eno-esque instrumental, "Phone Tap". "Car Crash Flashback v2" and "Neuro Video" are two of the most unusual tracks on the album, and are not unlike "Crash" from Shifting City, with catchy riffs, loops and treated vocals. Overall Sideways is upbeat, quirky and fun, and manages to connect to many aspects of Foxx's previous works. It is a shorter album than From Trash, although it is pointless to compare the two albums – despite emerging from the same recording sessions, both albums are very different, and nicely contrast each other. 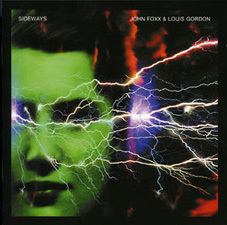 Had the background to these new tracks not been known, Sideways has the strength to stand alone as an inherently Foxx/Gordon album in its own right. The bonus disc features an interview with John Foxx, talking in detail about the songs that made up From Trash. It's really a pleasure to hear John talking so openly about his work, and to get an insight into the ideas and processes behind certain songs. This 2-disc set is a crucial listen for anybody interested in Foxx and Gordon's work. Sideways certainly takes the listener back in to familiar territory, which fans of Foxx's earlier work will surely appreciate, and newcomers will be enthralled by. Sideways was remastered and re-issued in 2010 with a different bonus disc to the original release, which included live tracks, remixes and extended versions plus one new track, "Haunted".